Persistent downtrend that had been prevailing in the preceding couple of weeks, percolated to third consecutive week that ended on November 13, following defeat of the BJP-led NDA in Bihar Assembly election and decline in IIP numbers for September and a flare up in inflation in October. Also, cues from overseas markets were negative fearing that the US Fed is firm on hiking interest rate in December this year, after about a decade of near zero interest rate regime. 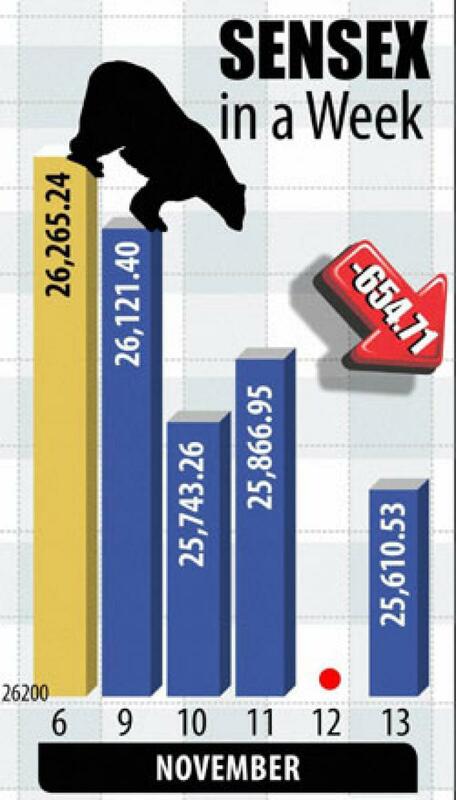 The Sensex plunged 655 points in the week that was marked with an adieu to the Vikram Samvat 2071 and dawning of 2072 and also had four sessions including the customary Muhurat trading on Wednesday. Markets fear that many economic reforms stuck for lack of numbers at Rajya Sabha in favour of government, would continue as the BJP-led NDA was grievously defeated. Thus, it was a stumbling block for the government and resultantly, for the economy, and therefore, for the stock markets. It was, therefore, due to this reason that the markets initially plunged by over 600 points on the very opening day on Monday but were floor-lifted to close the day with a nominal loss of 143 points on buying in the form of short-covering by bear operators. Stocks again plunged drastically on Tuesday ahead of the customary Muhurat trading for the fears of the impending interest rate-hike in the US and also unnerving global cues. In Muhurat trading, prices of equities rallied a little as the one hour auspicious session was marked with more of buy orders than sell orders, which is a custom with the investors as people rarely sell on Muhurat day. Besides, the government had a day before come out with a very liberal announcement of hiking FDI limits in certain industries or service segments. Meanwhile, the IIP numbers and inflation numbers respectively for the months of October and September, as announced by the statistical department of the government, turned out to be negative for the stock markets as the IIP numbers declined whereas the inflation rose. The rise in inflation once again dampened the possibility of a further interest rate-cut by the RBI when its governors' board meets on December 1, to review monetary policy. With the economic reforms becoming more difficult from being implemented or even cleared by the upper house of the Parliament, the government would attempt to introduce more reforms the way it did in the matter of FDI last week, but it would only be in piecemeal fashion and therefore far from creating a long lasting positive impact on the markets. For the markets return to a long-lasting uptrend, they certainly need to find out final bottoms in near future. The Bihar poll results have certainly shaken the markets very well but the final bottoms are most likely to be established in December when the Federal Reserve comes out with an interest rate hike. Although local and domestic issues have sufficiently weighed on the markets in the last couple of months and most of these have already been discounted in prices, the markets are unlikely to suffer huge losses in near future excepting untoward incidents and therefore, most of the stock market analysts are of the opinion that long-term investors should now buy shares of their choice if their perception is long-term investment. Investors are, therefore, suggested to buy shares of certain small-cap and mid-cap companies that have fallen significantly in the past few weeks. Even certain low priced or penny stocks that are unlikely to get broke or delisted so soon, can be bought in small quantities as percentage gains in these would be much higher than the gains to be attained from high priced blue chip scrips. However, while buying low priced and penny stocks one must never forget that one is buying for trading profits and not for investment appreciation, and therefore not forget to off-load with small or big profits or even at loss, if needed.